Due to its small 23x20 inch blade size, the Crest Shovel from CAMP would not be ideal in deep burial situations. However, given that the Crest is the lightest ISMF certified shovel on the market, it's perfect for skimo races when you have an army of blades for digging. It also has several options for condensing into or onto a pack so you can keep yourself streamlined during the race. Includes carrying bag with straps that can be lashed to a small or overly-stuffed race pack (85 grams). Handle slides into the blade for additional packability options, and redeploys quickly by pulling on the handle. Four slots on the blade enable you to use the shovel as an anchor or emergency stretcher when combined with skis. Aluminum alloy shaft is strong, rigid, and contoured for easy gripping. Polypropylene blade is designed to prevent the bouncing that occurs with other plastic blades. What is the width of this shovel blade? Hi - will this shovel be in stock anytime soon? Hi Bart, unfortunately it looks like those are gone for the season. Alternatives are the Merelli and ARVA. You cant beat this shovel for racing! The weight savings from a "real" shovel for the money is excellent. In real application, it does perform best in the sand box with my toddler rather than digging out a burial. It's the lightest shovel that is allowed for skimo racing so it gets 5 stars. Its super light. 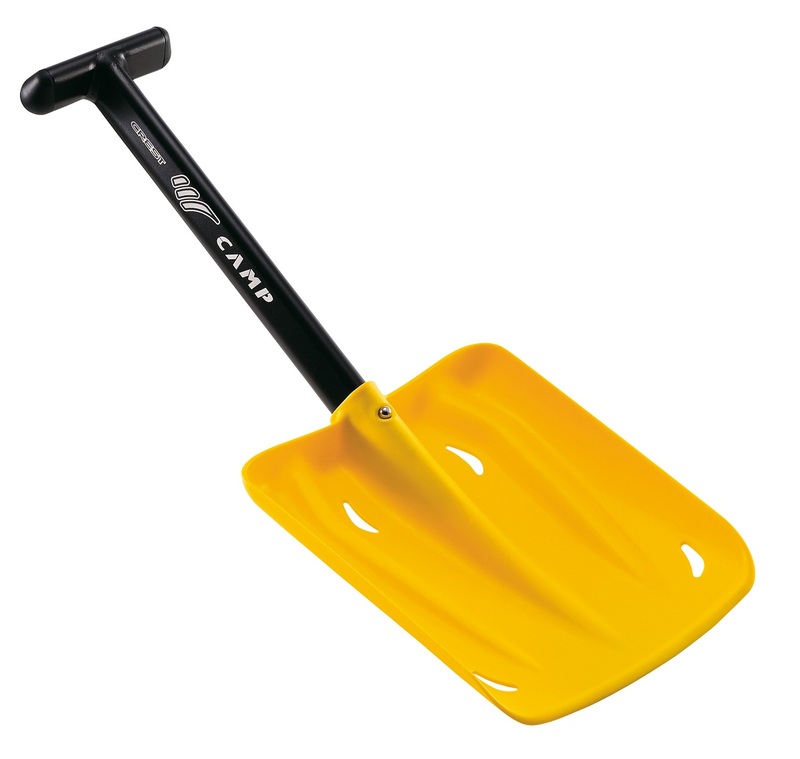 You would definitely not want to dig someone up with it because it seems flimsier than a beach sand shovel but its not actually for digging, its for show. IF you think there is a possibility of digging, take a real shovel! Overall: Five Stars for sitting nearly weightlessly in your pack to meet IMSF race regs (Section 10, Appendix 3). But as an avalanche safety instructor for AIARE and NSP (as well as an American Avalanche Associate governing board member), I feel compelled to subtract a couple stars lest anyone be tempted to bring along the CAMP Crest shovel for backcountry companion avalanche rescue, at which it would fare very poorly. So Three Stars overall. Background on product familiarity: The Crest shovel mainly just sits in my pack for racing and training, but my, ah, assistant (?) has also tested it out thoroughly. First, the first impressions out of the box: The shovel is small, very small. The blade size is adequate, but the shaft is only a bit longer than necessary to get one bulky gloved hand around the base of the shaft and another on the handle. The metal shaft seems sufficiently sturdy, and the small metal handle is okay for gloves (although probably not for mittens). The shaft inserts reliably and securely into the “neckless” blade, and the shaft end is nicely plugged. The suspect element is the blade: soft flexible plastic without any sort of reinforced edge. Second impressions, in use: If an avalanche did hit a rando race (which happened at the World Championships several years ago, though fortunately it missed any competitors), then perhaps a crowd of nearby racers could chip away enough at the avy debris to uncover and extricate a fully buried victim. But a single skier in the backcountry with only a CAMP Crest shovel to dig out a partner? Ineffective at best, and entirely impossible at worst. Note how it’s perfectly proportioned for her body (and she’s about average height for her age), and how it’s so light that she can one-handedly scoop up loose snow. She absolutely loves it -- I have to sneak “her shovel” away from here when packing for a race. Plus the blade is so flexible that she can’t inflict harm on herself or anyone/anything else. Third impressions, for long-term durability: The leading edge of the blade is already dinged up from some minor use. But the blade’s flexibility will probably help to prevent any conceivable catastrophic failure. 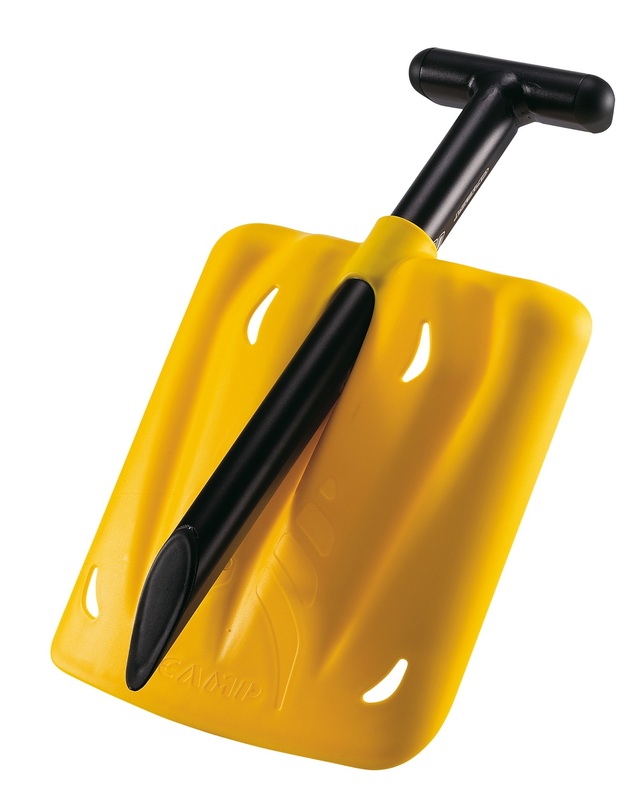 And anyway, this isn’t the kind of shovel you’ll be using frequently to actually, well, shovel. Most entertaining gear review ever? Possibly. I almost spit up my lunch laughing! Great statement on a situation where reality and meeting the spirit of the rules gets ridiculous. While I guess the current rule is better than when bear claws were OK, what next, ISMF avy beacons that have a battery, blinking light, certain dimensions and nothing more to them? The possibilities seem endless. This is a fine ultra-light shovel to stick in your race pack to meet 'full sized shovel requirements' imposed by most skimo races. How this satisfies risk analysts at the insurance companies that cover these races I'll never know. This is a "wink, wink' I've-got-a-shovel-shovel." Am I glad to race with it because it's so light? Yes. Would I have any confidence in having my life saved by a buddy using this shovel to find me? No. I suppose it's technically better than nothing and you could move some snow with it, but I'm pretty sure I'm more likely to be 'sleepin' with the fishes' if this is the only tool around and I'm four feet face down in cement. Use it on race day. Pray nothing wacky happens. And then, BUY A REAL FULL METAL SHOVEL for any serious backcountry ski excursion. Light is right to a point. My risk tolerance may be lower than yours but I'll take that criticism and be one pissed partner if this is what you're trying to dig me out with. Hi Jeremy. Indeed, as the description says, the shovel isn't really designed for situations where burial is a possibility. CAMP set out to meet ISMF regulations for races while being as light as possible, and they did a great job achieving those goals. It's a bit harsh to criticize a usage for which it's not designed. That's true, they're pretty up-front about the fact that this is designed to meet ISMF regulations. But, the fact is that there are a lot of naive consumers. I think it's fair to be very clear about this shovel's limitations. If it's mentioned in your description and again in the review I don't see that as a bad thing. It's great to tote around for a race, but I see this easily finding it's way into backcountry packs of the ill-informed because it's just so light and fun to pack! I have the shovel. I love it. I use it for race day. And I would be so frustrated if I ever witnessed some freak slide, say at the Highlands Bowls in Aspen during the Power of Four, and knew this was the only thing in my pack. Skimo courses are mostly safe, but snow is a curious medium and stranger things have happened.